Hamas terrorist from Silwan runs over pedestrians leaving light rail; 8 injured. Infant dies of wounds. A baby girl was killed and eight people were injured Wednesday, after a terrorist hit them with his car outside the Givat Hatachmoshet (Ammunition Hill) Light Rail stop. "A private car hit passengers from the light rail near the police national headquarters. The car's driver attempted to escape and was shot, apparently by a police officer from the Jerusalem district," police spokeswoman Luba Samri said in a statement. Footage of the attack has now begun to circulate. The grainy security video appears to show a white car careening across the median and straight at pedestrians, mowing down one of them. Police have now confirmed (7:30 pm IST) that a Jerusalem police officer did shoot the driver, seriously wounding him after he attempted to flee from the scene on foot. One witness stated to the daily that the attack was "horrific" and that "people were screaming." The area has been closed to traffic until further notice. Magen David Adom (MDA) medics, Hatzalah crews, and police have swamped the area. A spokesman for the emergency services said three people were seriously wounded. Another two people were moderately hurt and four more were said to have sustained light injuries. 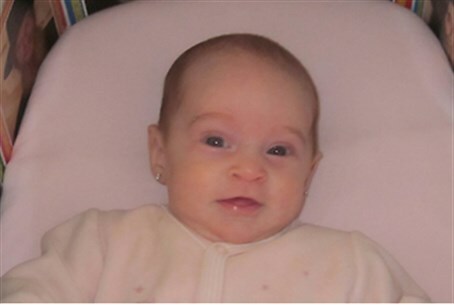 One of the wounded, a three month-old girl, died after being rushed to Hadassah Har HaZofim (Mount Scopus). She has now (8:00 pm) been named as Chaya Zisel Braun, hy"d. She will be laid to rest at Jerusalem's Har HaMenuchot cemetery at midnight. Shimon Helperin, the infant's grandfather, told Arutz Sheva that the Braun family - which had been waiting for a child for years - had been returning from prayers at the Western Wall (Kotel) when they were struck by the terrorist. Helperin and his wife had arrived in Israel specifically to meet their grandchild on Wednesday and was forced to go immediately to the hospital, instead. The Arab driver has now been confirmed (7:40 pm IST) to have been resident of the Shiloach/Silwan neighborhood and a member of Hamas - and to have served in Israeli prison before for terrorism, according to Police Spokesperson Micky Rosenfeld. "This is a natural response to the crimes of the occupation and invasion of our land by the Jews, particularly on the Al-Aqsa Mosque (Temple Mount - ed. )," Hamas spokesman Hossam Badran stated on official Hamas television. Hamas television has also confirmed the identity of the terrorist - who was shot and wounded by police, but is not dead, as initially reported in the press - as 21 year-old Abdelrahman Shaludeh of Shiloach (Silwan). Shaludeh had previously served in Israeli prison for terrorist activities. Jerusalem's alert level has also been heightened until further notice, police said Wednesday night. Hours later, close to 10:30 pm IST, Palestinian media reported that the police had entered Shaludeh's family home to gather evidence and confiscate terror materials. Shaludeh's father - who is also the brother-in-law of one former head of Hamas's "military wing," the Al-Qassam Brigades, according to Walla! News - reportedly physically confronted police. The attack surfaces just hours after Jerusalem Police District Commander Moshe Edri announced a "comprehensive plan" for a new task force to battle the cycle of ongoing violence in Jerusalem, which has been named the "silent intifada." Special surveillance was ordered to be set up around the Jerusalem Light Rail - which has been an ongoing flashpoint for violence over the past several weeks - including setting up observation balloons. Meanwhile, police and politicians are beginning to react to the attack. Blame is being put, as has throughout the past several months, on Internal Security Minister Yitzhak Aharonovich and the Israel Police, specifically Commissioner Yohanan Danino. Aharonovich has just arrived at the scene of the attack (update: 7:50 pm IST) and confirmed that it is a terror attack. Jerusalem Mayor Nir Barkat has also released a response. "We must restore peace to Jerusalem - as I said for months, the situation in Jerusalem is intolerable and we must be acting unequivocally against the violence taking place in the city," Barkat stated. Prime Minister Binyamin Netanyahu specifically blamed the Israeli Arab leadership for the attack, in remarks made to the Government Press Office during a security briefing on the attack. "This is how Abu Mazen [Palestinian Authority Chairman Mahmoud Abbas - ed. ]'s partners in government act, the same Abu Mazen who – only a few days ago – incited toward a terrorist attack in Jerusalem," the Prime Minister said.